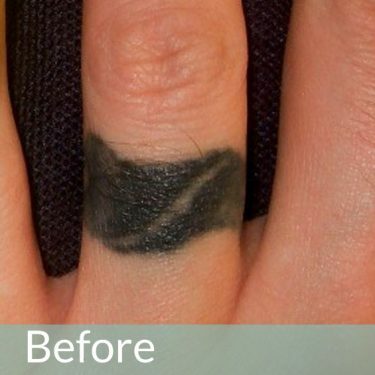 When it comes to removing a tattoo, we know there can be many reasons for wanting to remove the ink from your skin, it could be that you no longer like it or you want to fade it enough to cover it up with another tattoo, either way, Laser Tattoo Removal is a safe and effective way to permanently remove a tattoo. Laser tattoo removal is safe, effective and a straightforward method of tattoo removal. 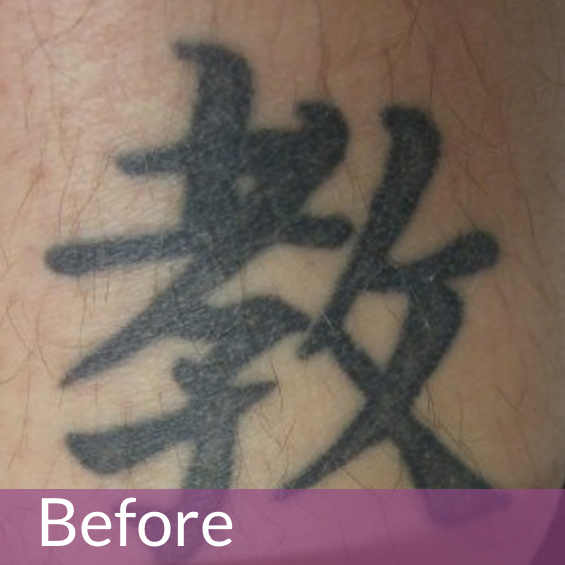 For over 25 years, lasers have been very successful at removing tattoos, which is why we have been removing them for over 22 years at Laserase Bolton. At Laserase Bolton, we use the Q Switched Ruby Laser, for the reason that it has been medically acknowledged as the laser of choice for tattoo removals. Furthermore, it’s the most powerful ruby laser on the market, providing patients with results in fewer treatment sessions on even the most resistant inks. The Q Switched Ruby Laser produces extremely short pulses of high-energy red light. The red light means that the energy is selectively absorbed by the tattoo pigment but not by the surrounding skin. Each laser pulse lasts only 25 billionths of a second and this heats up the tattoo pigment breaking it down into tiny particles, as a result, the immune system then targets these minute particles, which are gradually removed over time. 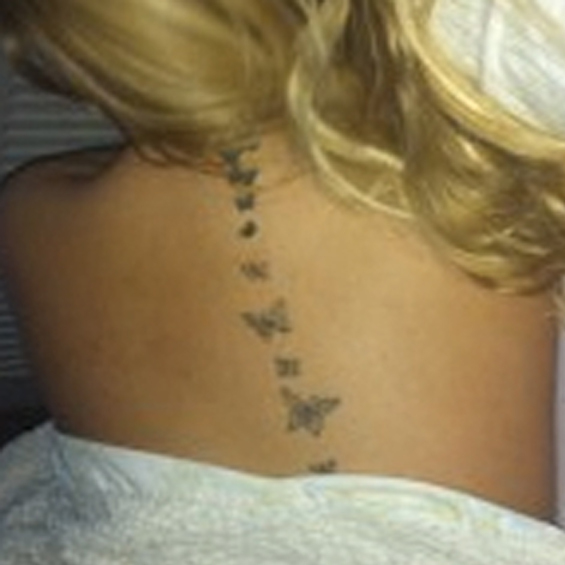 Why is a tattoo so difficult to remove? Tattoos are a result of pigment injected into the lower layers of the skin (the dermis) and the pigment becomes sealed away by a tough network of collagen fibres, hence why it’s difficult to remove the pigment without affecting the surrounding tissue. 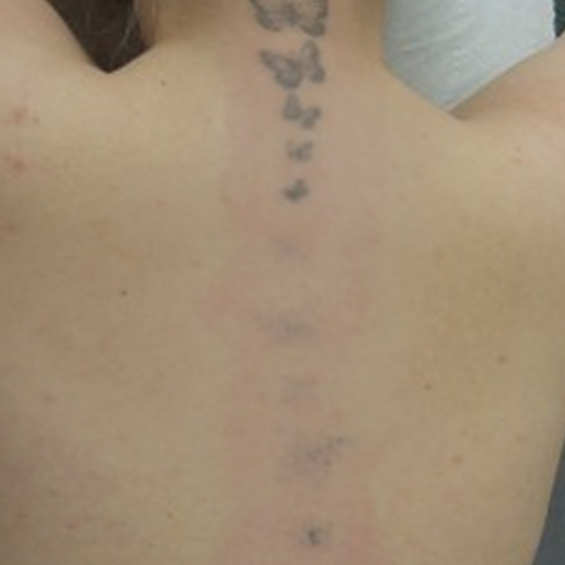 Before the development of laser therapy, the only alternatives were to physically remove the pigment and the surrounding skin by surgical excision and skin grafting or to chemically destroy the pigment using salts or acid, consequently, such techniques cause considerable discomfort, damage to the surrounding skin and require significant aftercare, as a result, this kind of treatment often replaces the original tattoo with a scar. Can a tattoo be removed in just one treatment? Some amateur (self-inflicted Indian ink) tattoos may disappear after only a small number of treatments, in contrast, professional tattoos always take a higher number of treatments. Due to the many variations in size, colour and type there is, we would need to see the tattoo during a consultation in order to predict how many treatments you’ll need. The number of treatments required will also depend on the body’s own defence mechanism and how effective it is; each individual responds differently. As a guide Indian ink amateur tattoos can take anywhere between 1-10 treatments; professional tattoos anywhere between 8-20. Without seeing the tattoo it is impossible to be more accurate, a consultation will provide you with a better estimate. Unfortunately not, however, most pigments, especially blacks and blues, do respond very well to Ruby Laser treatment, however, some pigments, usually greens, are resistant to treatment with any laser. In theory red pigment will reflect the ruby light and not respond to treatment although in practice some red tattoos fade very well. Very bright modern inks are less predictable, they may take longer to fade and in some cases may not go entirely. Some red, white and flesh coloured inks have turned black in the early stages but this is rare. As with all medical treatments, it is possible that not everyone will respond to treatment. Some patients may obtain a less than average response or may not respond at all. Book a consultation or call us on 01204 570 900. Yes, during your consultation we will give you an idea of how many treatments the tattoo removal will take, and an estimate of the costs involved. The actual number of treatment sessions depends on the size and colours of the tattoo and how deep the ink goes. 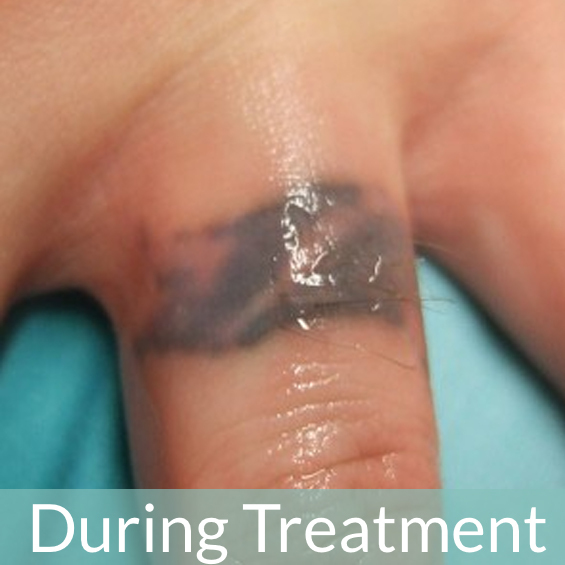 Not all tattoos respond to treatment. Some greens do not fade at all and some of the more modern bright inks will take longer to fade and may not disappear completely. In most cases it is easy to assess whether the treatment will work or not. Treatment with the Ruby Laser is uncomfortable but the level of pain depends on the area being treated, in addition, some patients may blister after treatment but this will resolve in a week or so. Full recovery usually takes between 4-6 weeks, during which time, you will need to keep the area covered or use sun cream with a of factor 20+. 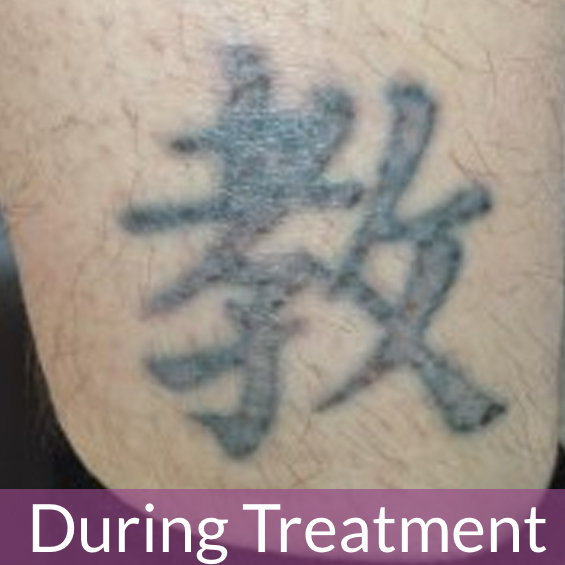 Patient Story: A tattoo over a tattoo! The tattoo I’m having removed, is a cover up tattoo of a tattoo I wish I never had. So I knew as it was a double tattoo I would have to have more treatments than if it was just a single tattoo. I had my tattoo done about nine or ten years ago, at a time when I wanted to rebel against my mother, who told me not to get any more. I decided to get it removed because, over time, I found it to be tacky and childish and it’s in a position that is difficult to cover. .
I’d wanted a tattoo of an owl for many years. They were my mum’s favourite animal and they’re mine, so I knew that no matter what, it would always be something that meant something to me. I spent months and months searching for the perfect owl and after trying and failing to find one I loved I sought out a tattoo artist I knew was excellent and asked her to design one for me. When your skin has been exposed to the sun it can affect your laser treatment. In some cases we will not be able to treat you. We may charge for the appointment.